The Court of Neptune, the fountain at the front of the Library of Congress Thomas Jefferson Building, adds a dramatic note to the building. Passersby enjoy the play of the jets of water on the majestic, bearded and muscular king of the sea; his sons the tritons blowing conches; the frolicking, horseback-riding Nereids (sea nymphs); and the water-spouting turtles, frogs and sea serpent, placed in front of a grotto-like wall. The tritons and the seahorses have fish tails instead of legs. The horse, sacred to Neptune, symbolizes water. The figures are heroic in size; Neptune would be 12 feet tall if standing. The details of the figures are beautifully modeled and the active poses are life-like. The energetic lines of the waving hair and manes, the galloping feet, and the twisting bodies add to the sense of movement created by the jets of water. New York sculptor Roland Hinton Perry was only 27 years old when he completed the fountain. He had studied painting and sculpture in France, and he had at first hoped to paint one of the murals for the Library. Perry's successful execution of relief medallions for the entrance pavilion led to the fountain commission. 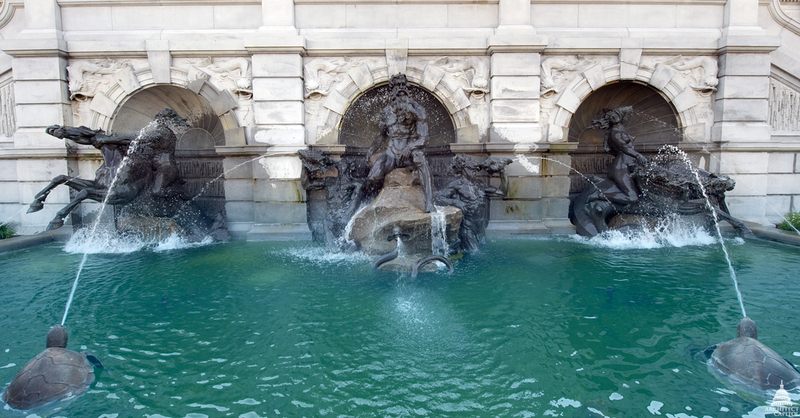 The Library's fountain, with its three groups in front of niches, was inspired by the popular 18th-century Trevi Fountain in Rome. Perry said, "I have tried to embody by Neptune and the Naiads [nymphs] the physical joy felt in masses of rushing water. Of course one loses a great deal of this effect when the fountain does not play. The powerful muscularity and strong movement of the groups seemed to me, when I modeled those figures, to represent the intense activity, the restlessness, and push of our peoples." The bronze figures were cast by the Henry-Bonnard Bronze Co., one of the finest foundries in the country at the time, and were shipped to Washington piece by piece. All were in place in early 1898, the year after the building opened. The grotto was carved with dolphins and stalactites by Albert Weinert to complete the sculptural ensemble. The fountain was conserved in 1993 and has been regularly washed and waxed to preserve the bronze.